Ma's Thai Restaurant uses their own specialised couriers to deliver their food. Minced chicken marinated filling in wonton pastry. Deep fried tofu served with sweet chilli sauce and peanut. Minced chicken curry filling in puff pastry served with chilli sauce. Fresh king prawn cooked in tempura battered with sweet plum sauce. Assorted vegetable deep fried in tempura batter. Your choice of vegetable or chicken spring rolls. King prawn wrapped with spring roll pastry with sweet plum sauce. Grilled chicken on a stick with chef's own special peanut sauce. Marinated minced fish with red curry paste served with sweet chilli sauce, cucumber and peanut. Prawn coated in desiccated coconut with sweet plum sauce. Tender piece calamari batter served with capsicum, spring onion and sweet chilli sauce. Delicious BBQ prawns garnished with garlic, ginger lemon and chilli. A combination of spring roll, prawn spring roll, chicken satay and curry puff. Grilled pork marinated with garlic, pepper and sweet chilli sauce. Grilled chicken Maryland marinated with lemongrass, garlic, pepper served with sweet chilli sauce. Grilled beef marinated with chilli, garlic, pepper with spicy chilli sauce. Deep fried fish fillet topped with red curry sauce and lime leaf. Deep fried fish fillet topped with three Thai flavoured sauce. Deep fried fish fillet with green apple salad and cashew nuts. Deep fried fish fillet topped with stir-fry vegetable with ginger sauce. Stir-fried mixed seafood, vegetable and sweet chilli paste. Diced lamb in tasty Panang curry sauce. Stir-fried sliced beef with mixed vegetables in black bean sauce. Fried rice seafood, tomatoes and onions. 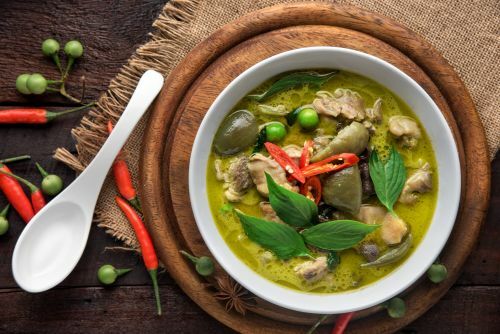 Thai green curry in coconut milk, mixed vegetable and sweet basil. Thai red curry in coconut milk mixed vegetable and sweet basil. Thickened and tasty red curry in coconut milk, lime leaves and capsicum. Popular beef curry cooked in coconut milk with various spices, tamarind, potato, onion, carrot, pineapple and peanut. Stir-fried cashews nut, vegetables and sweet chilli paste. Thai sweet basil, chilli, garlic, onion, capsicum and vegetable. Stir-fried mixed vegetables with tofu and oyster sauce. Stir-fried vegetables, fresh ginger, black fungus mushroom. Stir-fried garlic, pepper and served with steamed vegetable. Stir-fried vegetables, onion., and tomato with sweet chilli paste. Stir-fried vegetable, bamboo, Thai basil and red chilli paste. Stir-fried yellow curry sauce, egg and vegetable. Stir-fried mixed vegetables and satay sauce. Stir-fried flat rice noodles with egg, crushed peanuts, bean shoots and Tofu. Stir-fried thick rice noodles with egg, dark soya sauce and vegetable. Stir-fried thick rice noodles, chilli, garlic and Thai basil. Thai style fried rice with egg, tomatoes, onion and carrot. Stir-fried egg noodle with chicken and vegetable. Thai pineapple fried rice mixed seafood, pineapple and curry powder. Thai style grilled beef salad with onion, cucumbers, fresh chillies and lemon juice. Minced chicken cooked with ginger, onion, spring onion, roasted peanuts, chilli and lemon juice. Minced chicken salad with onion, spring onion, chilli and ground rice. Roasted duck salad with onion, chilli, lemon juice and ground rice. Calamari salad with onions, chilli, lemon juice and mint. Seafood salad with onions, chilli, lemon juice and mint. Prawns salad with onion, lemongrass, mint and mild chilli paste dressing. A classic Thai hot and sour soup. A classic Thai coconut milk soup, galangal and herbs. Tasty soup, chicken minced marinated wrap with wonton pastry. Thai style mildly soup vegetable with marinated chicken mince.